I am proud to be here today to sign into law real, meaningful pension reform that is fair to workers while also protecting taxpayers. This is a significant achievement for everyone who has worked on this issue, and I could not be more happy to join members of the General Assembly, both Republican and Democratic, to take this final step in the process. Before we begin, however, I want to thank those who have remained steadfast and dedicated to getting this pension bill passed. Especially Senator Corman, Senator Scarnati, Senator Brown, Senator Costa, Speaker Turzai, Representative Reed, Representative Dermody, and so many others. Today is yet another demonstration that by working across party lines and branches of government, we can address important issues. Working together, we legalized medical marijuana, continue to combats the opioid and heroin abuse epidemic, passed a liquor reform package, and invested in our schools in a fair and equitable way. 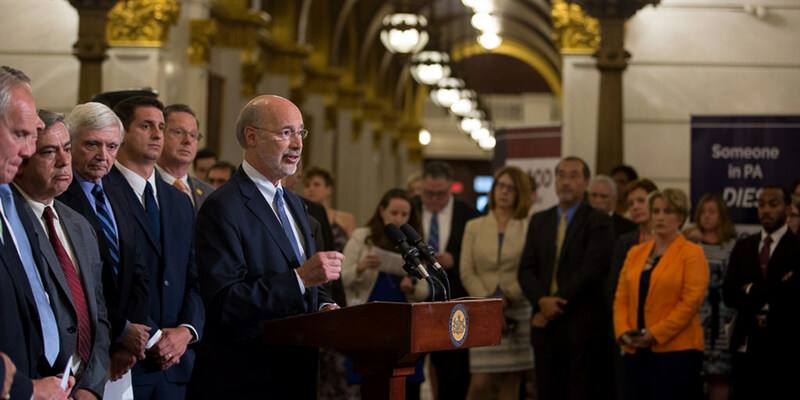 The common thread that runs through all of these successes is not just the policy changes that result from this hard work, but also that we are solving the problems that the citizens of Pennsylvania face every day. And now, we can add one more success to that list—pension reform. Senate Bill 1 makes significant changes to Pennsylvania’s retirement system while also protecting the benefits that our employees will earn over years of hard work. It reduces Wall Street fees so that more money stays in the pockets of Pennsylvanians rather than the wallets of Wall Street brokers. It shifts unnecessary risk away from taxpayers. It introduces a new, full defined contribution 401k style plan option for our new employees, just like the private sector. It will save over $10 billion dollars on Pennsylvanian’s unfunded pension liability. It will provide long-term relief to our schools, so when we send state dollars to districts, the funding stays in classrooms with our children. And let’s be clear: this bill addresses our debt in the only real and responsible way possible—by changing the structure of pension benefits. The fact is we cannot accelerate the shrinking of our debt on the backs of current employees. Even eliminating future pension benefits altogether would not change the reality that the only way to more significantly reduce our current debt is to pay our bills, every year, on time. Simply put, this bill is a win for Pennsylvania taxpayers and fair to Pennsylvania’s workforce, and I will be proud to sign it in a few moments. But first, I’d like to turn it over to Senate Majority Leader Jake Corman, without whom we would not be here today. It is because of his tireless efforts, and those of the others I mentioned earlier, that this important public policy change is about to become law.